Growing up in Maryland we simply referred to the homestead of our family friend as “the farm.” When I was a kid, the farm had horses for us to ride, hay lofts, cherry trees, sweet corn, and grape vines. On the farm “there are so many different environments, upland, lowland, stream-side, thick humus,” my father explained to me. 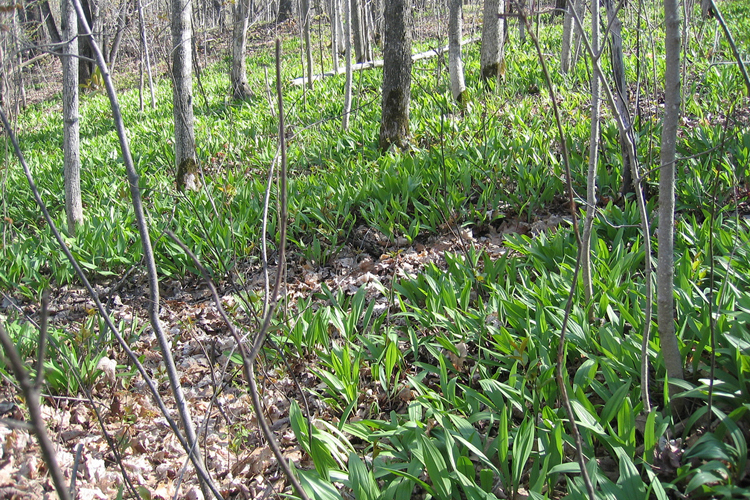 I remember my father taking walks to look for ramps, or wild leeks. “The ramps actually used to be a really dominant common plant, but during the Great Depression, and as the economy crashed and the chestnuts were dying back, people, when they foraged, tended to focus more on the ramps. A lot of places, ramps have been wiped out. The ramps proliferate in the moist forests with a lot of loam and around the creek lowlands. They’re among the first edible things to appear in the spring. Especially for things like the prevention of scurvy, the first good greens of the season, ramps were the target. So in places where there was a lot of poverty, they got wiped out. “For the most part, they’re prepared like leeks. I never used a lot because a lot of people find them very strong. As they say, ‘All the dentists’ offices close during ramp season.’ It’s a West Virginia joke. I don’t know if it’s true or not. A picky eater as a child, I had little interest in odd strong garlicky onion things. How about puff balls? They cannot be misidentified and are delicious. My father always liked to hunt for them in Montgomery Co years ago and after he died, I found a cluster in his back yard! There is a Ramp Festival in WVA in early spring. Old friend told me about it. He was crazy for them! Working in restaurants in DC, MD and VA, ramps showed up during Spring in everything including soups, omelets, salads, and potato side dish. We all smelled for days after eating. I love odd strong garlicky ramps. Most definitely a veggie I miss down here! I’ve never tried them because I was a picky child. I haven’t been back to the East Coast for the spring in years!